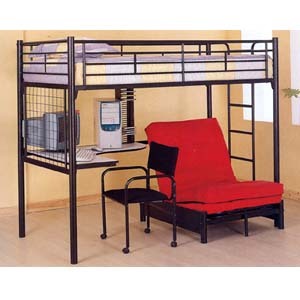 Twin Size Workstation Loft Bed with Desk and CD Rack: Contemporary Style. Includes a Bed on Top, A Computer Desk and CD rack. Black Finish Durable Construction. 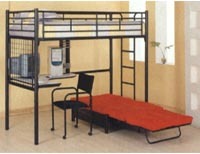 Does Not Include Mattresses.Futon Chair And Task Chairs are(Optional). Bed Dimensions: 78.5 In. Long x 42 In. Wide x 69.5 In. High. Futon Chair Size: Approx. 78.2 In. long x 42 In. wide x 69 In. Bed, Box Wt: 180lbs. Futon Chair Wt: 50lbs. Futon Chair Mattress Wt: 30lbs. Futon Covers Available In Different Colors (Look At The Bottom Of The Page). 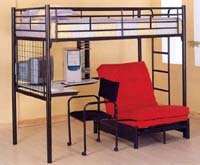 Please Note, The Futon Chair Uses The Cot Size.